Keeting: Are either of you interested in commenting on the animistic nature of these works? Both of you seem intensely involved with careful articulation, with specific organically derived joinery, and the totalities of each piece have creature-like temperaments. 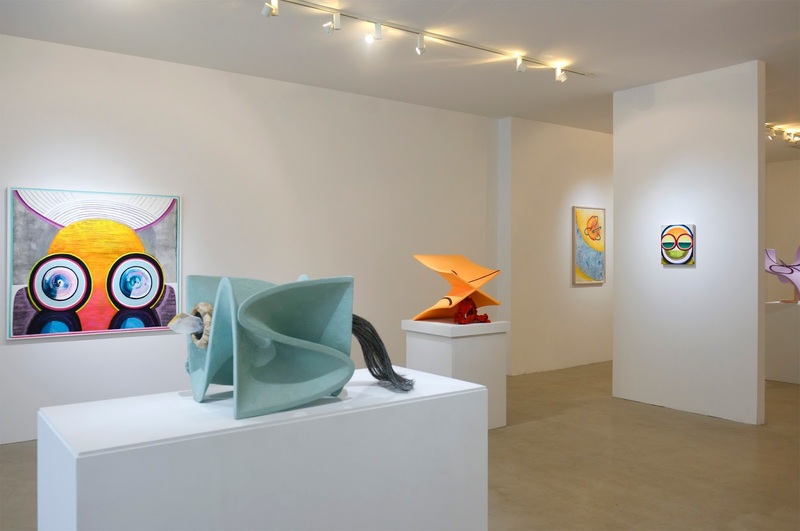 Are you hoping to bestow upon the paintings and sculptures living energy? Are there forces acting upon these creations that twist their visage, that contort them into anomalies? Clint, with such titles as Astral Projection, Space Age Club, Two Moons I think of extreme altitude (or submersion), a total lack of atmospheric pressure (or the opposite), a craving need for exploration that shapes these be-goggled personalities. Psychotrope and Grand Delusions seem to imply substance alteration, ego-inflation, the wooziness of intoxication, hellish mornings after with baggy eyes and puffy, bloated indigestion. Attitude Adjustment speaks to societal pressures as well, of forced conformity, for better or worse. John, your titles are more factual, but some do allude to life and the contortions of performance, for instance: Danced Mask, Small Theatre. Many of the objects look to me like fantastic organisms freshly out of the primordial ooze, in the midst of mutation, caught in half way points of elaborate evolution, straining for adaption. Lavender and “Underneath the Big Umbrella” is especially primed for a stroll under undetermined atmospheric pressures. Newman: If I understand animism as the attribution of a soul to inanimate objects, or a belief in some supernatural power that lies embedded in inanimate objects, I would say no. My work is very far afield from that kind of thinking. I am, indeed, interested in other cultures that do see this as a belief system, and more interested in the art they make. For example: Oceanic art, which I am obsessed with, and collect, having spent a good deal of time in Australia and Indonesia. 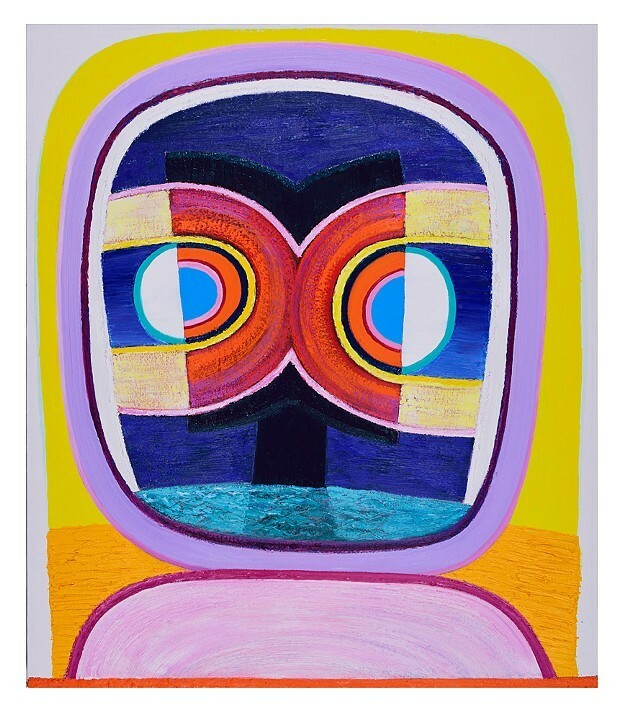 Indeed, one of the first things I thought about when I saw Clint’s paintings was how they had a formal / structural linkage, if not a more poetically charged association, to the boldness and scary / humor of some New Guinea masks. For example, I own a mask from the Baining islands off the coast of New Guinea that has these giant concentric circled eyes and a goofy bird / man / cartoon-like face. When I was thinking of buying the mask the dealer said to me “you can tell it is a good one, because it has been ‘danced’ ” … meaning you could see its authenticity, the sweat marks from wear and the smoke stains from the rituals where it was worn. I was charmed and enthralled by this wonderful way to describe it, let alone the odd use of the verb. And I did steal that for the title Danced Mask, Small Theater. Yes, the way components fit together, the articulated joinery, as you call it, is a very important part of my work. I have also joked about what I called my liver-transplant theory, something like: if a foreign element is brought together into a larger structure will it be rejected and kill the whole, or be accepted, and allow it then to live. 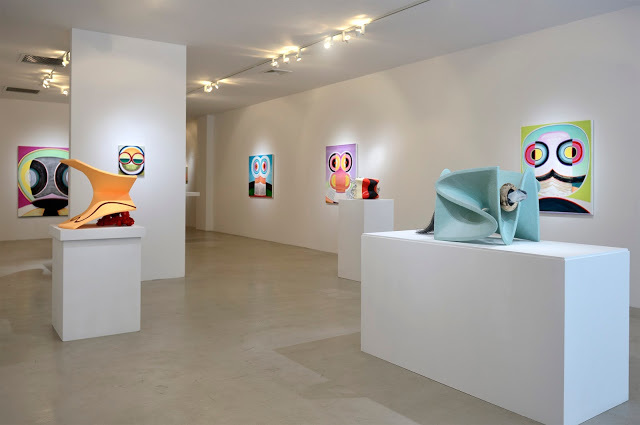 As far as “creature-like temperaments,” I am aware that because my sculptures are not easily nameable there is a tendency, even a longing, to try and impose some kind of literal association upon them, or parts within them. I certainly can understand this impulse but actually I find it disappointingly simplistic, if that is as far as it goes. The twists and contortions (in my work) are more aligned with ideas about topological deformation and the haptic, rather than some kind of caricature-like exaggeration. “Many of the objects look to me like fantastic organisms freshly out of the primordial ooze …” I wonder if this interpretation comes from the quizzical nature of some the forms that I put together. I don’t think in those terms. I have always disdained the easy reading that my work is aligned with so-called biomorphic abstraction. What a cumbersome term! But, “caught in half-way points of elaborate evolution straining for adaptation” does have some resonance for me. In the last several years I have been thinking a lot about broadening the spectrum of sculpture’s vocabulary. Combining different materials and processes (all of which have specific properties and associative potential) metaphorically, trying to elicit in-between meanings. I also began thinking about the identity of the material itself. Of course, in the 60’s material was supposed to be truth. But covering up or transforming was always a method as well, for example: casting, painting and patina, etc. I decided not to set these in a binary position but have them be part of a grey scale of possibilities, including using found objects. And during this time, I came upon these industrial mistakes, these chunks and chaotic ribbons of extruded aluminum and copper that looked liked magma, like sped up geology, like fractals, or even like Bernini; completely anonymous and otherworldly and I couldn’t resist including them in this ever widening spectrum of sculpture’s vocabulary possibilities. 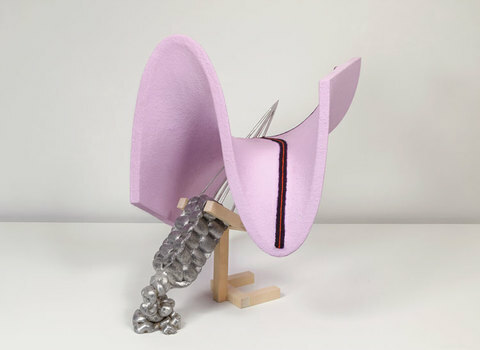 John Newman, Lavender and “underneath the big umbrella,” 2014; computer generated and milled foam, extruded, cast and fabricated aluminum, wood, acqua resin, acrylic and oil paint; 24 x 24 x 20 inches. As for Lavender and “Underneath the Big Umbrella,” the title is both descriptive (the color) and anecdotal. In the early seventies, people used to say that sculpture was this “big umbrella” that sheltered everything that wasn’t painting. And I always felt that to be an important aspect of trying to understand what sculpture was, is, and could be. In the Red and on the Hot Seat was kind of personal punning, taking the color and position of the sculpture and aligning it with those idiomatic and fraught phrases. 21.5 x 21.5 x 21.5 inches. Jukkala: I haven’t been thinking about animism specifically, but I suppose there’s a correlation. I’ve been thinking about imaging some parallel world, I don’t conceive of it as a spirit world, but it’s the stuff around us that we can’t quite perceive or have the language to explain. Maybe we could if we had different lenses or devices to experience the world through. Many of my paintings have forms that suggest heads, eyes, etc., but I’m less interested in the “looks like” quality of them and more interested in how the images can point to sensory experiences or states of consciousness. At the same time, I hope my work evokes something humorous as much as spiritual. It’s a belief system formed by Sunday morning cartoons as much as anything. I spent my early painting years in Seattle and was able to see a lot Pacific Northwest Native art. I took a class with Robin Wright that I was blown away by. I never felt my work had any relationship to it, but somehow those connections started to unconsciously seep in over the last five years. I’ve always been interested in figure / ground relationships for how they suggest a continual equivocation, a lack of fixedness. Somewhere the Bauhaus ideas started to fuse with other influences. 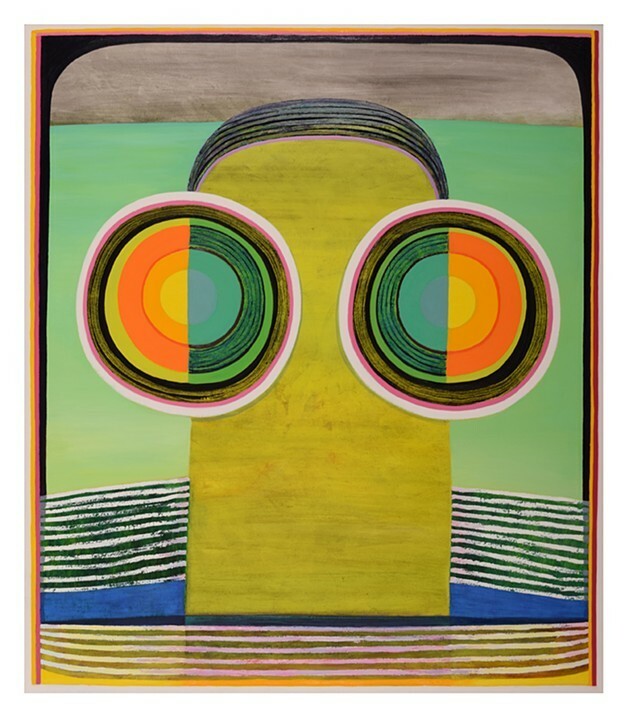 John’s work is so exciting and I feel like it taps into a strange, distant world. His sculptures don’t look like familiar things to me, but the hues, surfaces and forms combine to suggest qualities of things I’ve encountered but can’t quite put my finger on. They also constantly shift due to their three-dimensionality. They appear to be one thing and become something very different as you move around them. They never settle. I like your response to the titles. For me the paintings are often about escape portals of some sort. Windows to a place where the rational gives way to the irrational, places we might go if we weren’t bound by our thinking. Portals accessed through dreams, intoxicants and altered states. The escape is psychological, like wearing a new pair of glasses that allow us to see the world in a different way. Color is especially important to me in this regard and I really see it in John’s work. Color is a portal. It is full of histories and associations, but it is also purely experiential and beyond language, it can take us to another place. Clint Jukkala, Psychic Continuity, 2015, oil on canvas, 60 x 52 inches. Keeting: John, I’m curious to hear more about the “identities” of these materials. In terms of raw, unaltered matter – what is the identity of lead, what is the identity of cork, what is the identity of aluminum, etc.? Is there an identity beyond the name, such as specific associations each material conjures in your mind … or socially resonant / culturally predetermined associations … that you’re riffing on when you combine these substances? And more specifically, the “grey scales of possibility” that occurs when you treat a material, warp it with manipulation, and contort it into something enhanced / disguised / resonant: does the identity of this newly altered substance have greater inherent meaning? Is it a more powerful orchestration tool? Organization, orchestration, the snug fit of unexpected juxtaposition lends your work terrific presence. Are there certain types of collisions that hold greater potency in your mind, in your eye? You’ve frequently used wild, loopy patterning across undulating surfaces. These very often come slamming up against ruggedly tactile passages, extruded metallic goo. Does math act as a perfect foil for grime? Is grit best deployed arcing through velveteen void? Are there partnerships you’re particularly excited about: copper and quarts / burlap and epoxy / glass and cheesecloth? Other pairings you consciously avoid? Newman: Honestly, I did not mean “identity” in such a high-minded sense. I meant actually being able to recognize and name the materials, and of course, each material has its own properties: color, weight, texture that contributes to the associations and references that might come up. I am also interested in NOT being able to identify the materials: that certain forms in the sculpture are anonymous or stubborn to naming. Certainly, when materials are painted or coated or covered, another set of “readings” and responses becomes available (much to the dismay of the purveyors of the old saw of modernist sculpture: “truth to the materials”). In another way, when a material is cut into or gouged or layered-upon creating a low relief, there are added opportunities. I am mostly interested in how certain materials (and processes) interact with others. I like to think of each component’s “fit” as specific to the particular nature of each sculpture. It is not just a collection of unconnected elements. I used the term “vocabulary” earlier, to point to a broad spectrum of elements; I should add that I also feel there is a grammar, a structure, as to how these elements or components link-up and function together. Please note that in each sculpture there are always a very limited number of parts. This is not “assemblage”. It is not an endless build-up or a piling-on. I want each piece and each component to have uniqueness, or at least seem to be new information for me. I suppose it is fair to say that Judd’s famous article on Specific Objects was fundamentally important in helping me to develop this point. As for the “inherent meaning” as you call it, I am not sure what that is. It sounds like we are getting back to the animism question again. I have certain ideas and interests and stories and references and associations and challenges that I set up in the making of each sculpture, but I am just as interested as to how the viewer unfolds and unpacks them, like reverse building of the sculpture, which is YOUR experience. I am interested in mathematics, but mostly because I have found it useful as a way of constructing metaphorical-like meanings. For example, non-Euclidean geometry and topological deformations are involved with complex thinking, but I think anyone can easily understand, viscerally, what knots and tangles and bends and twists are, how they feel and what they mean. Keeting: Clint, your paintings have gone through a number of notable transitions recently. If we look back to 2006 / 2007, there was great amount of spatial stacking, but your geometric bars and contours all aligned themselves harmoniously with the picture plane. This no longer holds true. The pieces, now replete with chewy modeling and wet with atmospheric fades, are exponentially more complicated. This is strange, since fewer objects are rendered per canvas. There’s also an undeniable care you are now bringing to the edges of forms, where one energy field drops off and another picks up. Would you like to talk about this new finesse? The older work seems more workman-like in surface … more aloof in emotionality, because the touch was less engaged. The recent pieces have an attention, an overt tenderness that to me looks like vulnerability. Is this something you’ve consciously sought? The surface variety within these paintings is now quite vast. I remember you trying to achieve poured geometry. Is that in there? Jukkala: For a number of years my paintings were guided by color and geometry. I was interested in systems, spatial stacking and simple ways of building structures. Things really started to shift around five years ago, when my daughter was born. My world-view began to shift and I started to see things anew. I became less interested in the formal structural stuff and more willing to follow intuition. If there is tenderness or vulnerability in the new paintings, that’s were it comes from. The structure of my old paintings provided firm ground. I started to leave that behind and became more willing to embrace the goofiness and strangeness of things. At the same time I was getting bored with how I was making paintings. I wanted the process to be more engaging. The answer for me was thinking of the surface in a more tactile way. I started to consider each color or element as having it’s own distinct surface and materiality. It’s subtle, but in that way I find my new paintings feel more sculptural or built. I really relate to John’s work in this regard. He has such a great sensitivity to shifting materials and surfaces and it’s a holistic part of his work. You can’t separate the form from the color and surface. Keeting: John, when I visited your studio awhile back, you spoke of a particular gravitational problem you’d given yourself and the challenges of attaining intense cantilevered positioning within a certain sculpture (I’m sorry, but I can’t remember the title). It involved a lot of hidden weight, and the results were amazing … the tilt looked impossible. Is there a piece in the Giampietro show that was exceptionally tricky to pull off on a technical level, who’s execution felt like a high wire act? If so, did this engineering summon up unexpected aesthetics? I’d also be curious to know if there is something that could coalesce within a sculpture – a certain grammatical topology – that consistently pushes your buttons, and has remained strictly off-limits. I ask this because so much seems possible. I’m not asking about a dash of abject sloppiness, or a glob of excessive addition … but something that should theoretically work within your universe, but hasn’t yet been allowed. Clint Jukkala, Peculiar Velocity, 2015, oil on canvas, 28 x 24inches. Newman: Yes, somewhat recently, engineering, if I can call it that, has been very interesting to me. How to get things to STAND UP BY THEMSELVES, what a metaphor that is! Cantilever was a particularly fraught position, given its stretch, its reach, its extension, and I thought that had a clear visceral / emotional resonance. And in a sense, easy to grasp, even if the thing you were looking at was not. I remember looking at banyan trees in India where the branches stretch so far from the trunk, and then because of the weight, fall to the ground and begin to take root and become another linked but ultimately independent tree. I just loved that. And I find cantilever endlessly dramatic and tenuous, as if you have to hold your breath to look at it or it will fall. When I first began what I call my new work, meaning work after the mid-nineties, after I left teaching at Yale and spent a good deal of time traveling in India, Africa, and Asia, the only work I could do while traveling was to draw. 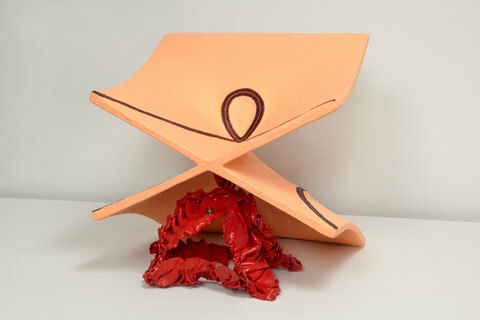 I was drawing these sculptural speculations, imagined sculptures if you will. And, of course, because they were drawings I did not have to deal with the fullness of the form, even if it appeared to be a rendered volume. I did not have to deal with weight or adhesion or gravity or solidity for that matter, and frankly I wasn’t even thinking in any of those terms at the time. But when I got back to my studio I decided as a kind of challenge to myself, that I would try and turn these drawn things into sculptures (knowing full well that aspects of them could not be made or certainly, at least, that I did not have the skills to make them): almost like the reverse of drawing from observation. At that time, I also rediscovered Calder, for myself. As if I had some new prescription for my lenses and could see what he was doing afresh, and suited to my needs. The buoyancy, the weightlessness, and therefore the joyousness, was something that I was enthralled by and somehow wanted to have in my work. I was also re-looking at Bernini. In 2003 I lived in Rome for a year. And I was entranced with the idea of illusion in sculpture. Apollo and Daphne being one of the greatest things I have ever seen! As a graduate student at Yale in the early seventies and very much a third-generation zealous student of minimalism, illusion was verboten! But, somehow, I needed to provoke and challenge those entrenched ideas. And to make certain cantilevered pieces work I needed to have counterweight. Hiding the weight enhanced the illusion. It made the very physical presence of the sculpture a kind of fiction, and I was fascinated by that oxymoronic relationship. As Judd said, one of the greatest things sculpture has going for it is that it is HERE! I also wanted to add an extra contradictory layer to that thinking: and HOW is it that it is here? As far as your second question, each piece sets up its own set of concerns and challenges and, ultimately, surprises. But if I find myself relying on familiar solutions I need to throw some kind of monkey wrench in there to change it up, to keep it fresh. I have often been told all my pieces look very different, and I want that and strive for that. And yet some times in moments of doubt, I think, in certain structural ways, they are all exactly the same! Keeting: Clint, when John speaks of grammar, and how within each piece “there is always a very limited number of parts” I think of you. The number of components within each of these paintings is finely calibrated … but like I said earlier, the overall impact is less simple. The images have a comic book humor, but they’re also clearly chiseled for maximum impact. Are your bands of radiating, gradient color deployed with grammatical logic? Is their placement / order entirely intuitive always? Does it matter that tangerine is next to saffron? Or are these auras meant to accrue dynamic strength percussively, so that individual tones can be missed amidst the flurry, whilst the totality rings true … like Art Blakey on drums? Jukkala: I often think of painting in terms of grammar or syntax, of the component parts and how they are arranged within a system. I’m not sure about the logic of the color. Sometimes I approach it in a matter of fact, associative way: blue above suggest sky, blue below suggests water. Often times I think of color more in terms of sound or frequency. The overall color matters more than any individual colors, and I want there to be a particular vibration or resonance to each painting. I think / hope it matters in all cases what colors align, but it’s mostly intuitive. I like the term calibration and I often think of adjusting elements as if I’m tuning into a particular frequency. Usually when I’ve found the right place on the dial I know, but I’m not sure there is much logic to it outside of my own head. 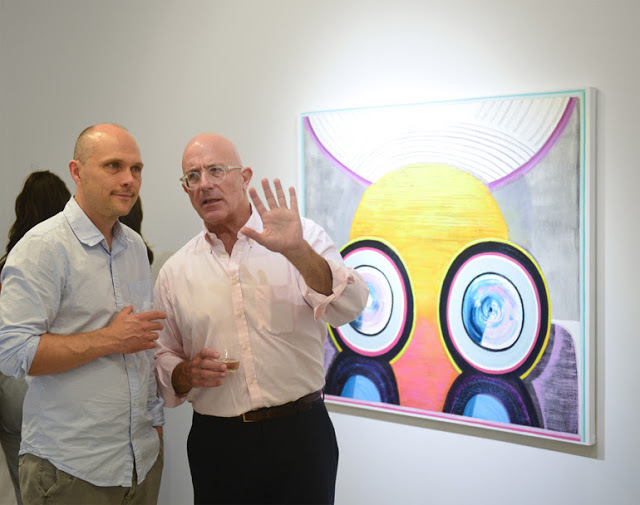 Clint Jukkala and John Newman, FRED.GIAMPIETRO Gallery, New Haven, CT. Through October 17, 2015. Also on view: paintings by Celia Johnson, and ceramics by Joan Zagrobelny. Great interview! It's always interesting to pick an artist's brain and take a look at what's going on inside their head. It's fascinating to see how their thoughts translate into the art that they create. Previous Previous post: Pre-game: Who’s included in “Greater New York”?